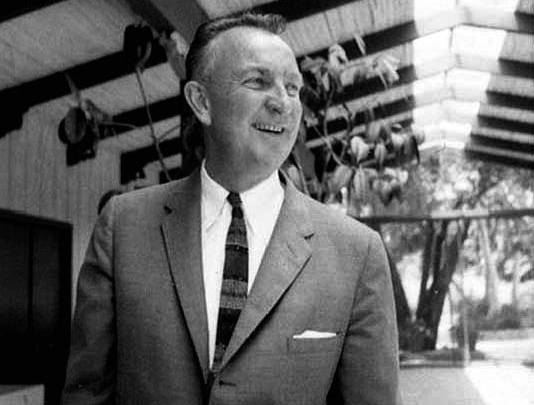 Architect Cliff May in the 1950s. 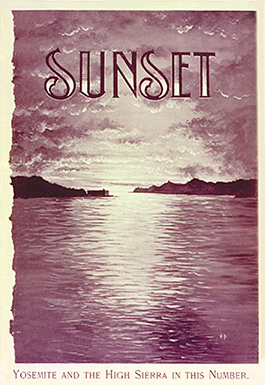 Debut issue of Sunset from May 1898. Mid-century modern gets the cover, October 1959. The influence of Sunset—founded in 1898 by the Southern Pacific Railroad, bought out by the Lane family in 1929, and headquartered for five decades in San Francisco until the 1950s—was deeply appreciated by young architects and landscape architects, especially in the years following World War II. "Sunset magazine played a major role" in creating what was later called "the Bay Region Style," Goody Steinberg, a leading modern architect on the Peninsula, said in a 2004 interview. 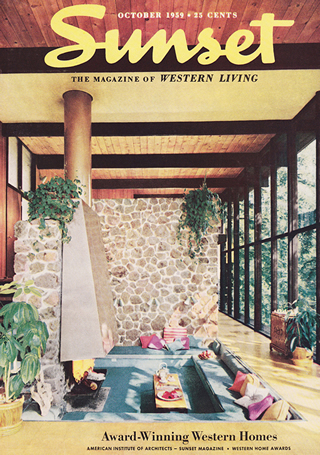 "Sunset trained so many young architects and published articles about [western] living." "They thrived on publishing the work of these people," Steinberg said, "and we got publicity so that we got more work." Sunset played a particularly important role in the career of architect Henrik Bull, publishing in 1958 a cabin with an "unusual folded roof" he designed before age 30, and giving him two covers in a single year (1962). It hired him that year to design an idea house—"the first house Sunset has sponsored in many years"—that the magazine opened to the public and published again a few years later to show how its garden had grown. Bull, who became friends with Sunset publisher Bill Lane (1919-2010) and later designed a Lake Tahoe home for him, praised Lane for being a strong conservationist and philanthropist. "But he's an active Republican, so I don't talk politics to him," Bull said in a 2006 interview. Sunset's most important architectural relationship was undoubtedly with architect-builder Cliff May (1909-1989), one of the inventors and chief proponents of the California ranch house, who was published early and often in Sunset, as his homes shifted increasingly from adobe-themed to glass-walled. "What gives the ranch house such universal appeal?" an article asked in September 1954. "Partly, perhaps, its very looks—a long, low silhouette with a gently sloping and overhanging roof sheltering the house against sun and rain. And partly, it is the sprawling plan, with most of the rooms open to the out-of-doors." In 1950, when Sunset wanted to build itself a new headquarters, in Menlo Park, that would serve as a model for the perfect Western home, Bill and his brother, Mel Lane, who ran Sunset Books, chose May to design it. "We've taken a lot of our own medicine in planning, gardening, and cooking in our new suburban home," Sunset told its readers in 1952. The ranch house as defined by May—low and long, rustic yet refined, designed for modern living with innovative touches—became the basis for everything Sunset desired in a house.